I always roll my eyes when people talk about the extra hour of sleep they're going to get when the clocks fall back in autumn. As if any one with young children gets the opportunity to sleep in... the kids never sleep an extra hour. Although, I must confess it is getting easier. Now that the girls are able to get up on their own, turn on the tv to their favourite shows, and even manage to get some cereal to stave off their hunger, we have been lucky enough to actually sleep in a little bit on the weekends. But, an extra hour in a weekend - so many things I could do with it! I've written in the past about my internal debate of whether or not to sacrifice weekend time for a nap. But now that even the younger of my kids are less likely to voluntarily settle down for a weekend snooze, I'm finding my choice to nap is being affected too. Oh, I still love a nap. It's just that there are so many other things to fill the time. Take today, a incredibly rare 25 hour day. Even today, I didn't nap. A choice I may now be regretting. But what did I do instead? How did I spend my extra hour? I began my day with a reorganisation of my spice rack and pantry, interspersed with cut-and-paste assistance. After making pancakes, I took the girls to church, followed by a quality lunch of Chef-Boy-R-Dee ravioli and veggies with dip. Then, instead of napping, I ran almost 10 kilometres. This is a recent trend which really makes me wonder what is happening to me... choosing to run instead of nap... what on earth is going on? After my own lunch, and a small sit down to watch a fashion design competition by my girls, I headed to the grocery store with my youngest to pick up dog food, paper towels and baking powder. Things I've missed from my past three or four grocery trips. Yard work followed by dinner preparation interruption by kids squabbling over costumes and dress-up. How did you spend your extra hour today? I usually don't give much thought to Christmas preparations until about the middle of October. I set myself a Thanksgiving deadline for providing my parents and in-laws with the wish-lists they have requested for the kids. Even then, it's incredibly difficult to get the children to focus and choose and limit their requests to something that they might still possibly want two and a half months later. And trickier still to organize who is being told who wants what. However, I'm feeling pretty ingenious right now. After Madeleine's recent birthday, when I was trying to keep track of who was getting which of the three hundred and seven Beanie Boos and Monster High dolls that she had requested and we still ended up with a couple of duplicates and a last minute switch-out, I decided on a system which I hope will help save my sanity by limiting the need for me to personally remember who has been told by whom what they want and what has already been bought by whom. Google Drive. I've created a Christmas Lists spreadsheet as a shared document on Google Drive. Like a registry. But with no particular store affiliation or requirement. This could be the perfect solution. I'm sure that my parents and in-laws will need a tutorial or two, and heck, I may even be updating it myself on their behalf, but at least I have a system. Let me begin by clarifying that I really am sick: congested, coughing, phlegmy, sneezing, tired, head-achy, sick. And I was napping, but a jackhammer outside my window rudely woke me up, and I'm afraid to lie down again until I know for sure that he's finished. A jackhammer and a congested, aching, tired head are not good company. So, in addition to responding to a handful of emails for work, totally ignoring the mess of toys in my basement and dirty dishes in the kitchen, and watching some daytime talk shows for the first times in years (Maury is still on the air - really? ), I thought maybe I could pay some attention to my ignored-for-far-too-long-blog. I used to hate it when people gave the excuse of being 'so busy' for not calling or keeping in touch. Or that there's 'never enough time' for getting something done. Isn't there some expression about making the time to do the things that are really important to you? But now I'm making the same excuses. Cliche? Yes. But seemingly true. Even on some kids-free vacation days last week, I wasn't able to get around to some of the projects I had hoped to. My list of things to do was just too long, and everything always takes longer than I think it should. Even without kids in tow. I started a Never-Gets-Done List a while back. But I haven't even been able to keep it up-to-date. Amazingly, after 2 years, I am starting to make progress on some of the items on the list. But there are also many more things I could add as things I can never seem to find time for. Like taking the kids for bike rides more often so my eldest can get more comfortable riding without her training wheels. Making more trips to the beach, which is just a twenty minute walk away, and yet, we only made one trip this summer. Weeding and pruning my untended garden, something that I actually enjoy doing. Getting out for some runs and exercise. Note to self: start my up-early in the morning routine again as soon as I am healthy. Visiting more of the beautiful places and campgrounds in our province. When driving home from our one camping trip this summer, I was inspired by the pictures and descriptions of other park grounds in the Ontario Parks brochure and started to think about how we could manage to travel to more of our province and country in the years to come. Taking my kids to the library, and just spending more time encouraging and practicing their reading. As I'm reading over this list now, I am noting how different these activities are from the to-do items from before. Much more about taking time for myself and spending time with my family, instead of getting things done. Is this progress on my part? I hope so. Maybe I'm finally learning to let the to-do items slide and focus more on the things that are truly important to me. I guess the next step is make the time to do them. Do at least one load of laundry every day. And try to fold and put away the clothing right away. Laundry, like most things in life, it is extremely manageable in small amounts, but seemingly insurmountable and totally overwhelming when the piles are allowed to accumulate. Things will not get put away. Your house will get messy. Acknowledge that your standards have been lowered, whether by choice or by default. Learn to associate an untidy home with a busy and happy home. And know that it can always get tidied when the need arises. Plan the meals for your family, even lunches, and grocery shop accordingly. Having a sense of what you will be making for dinner and knowing that the right food is available is incredibly comforting as you race home during rush hour and pick up your whiny, not-listening, difficult yet wonderful and beautiful children from daycare. Then, once home, you can almost sort of relax with a glass of wine as you prepare the meal while your children watch some television. But allow yourself to totally ditch your plans and substitute with Mickey D's or order in pizza on those nights when you just don't feel up to the task. Still drink the wine. Allow your children to watch some television. Not a lot. But enough to give you a break when you need it, get some extra quiet time on weekend mornings, and permit a little unwinding for everyone after a long day. Whether it is your in-laws coming down once a week to pick the children up from daycare and prepare dinner, your sister coming over to babysit on a date night with your husband, or your neighbours offering to coordinate the arborists' estimates for removing the dead tree on your shared property line, graciously accept the assistance and support of others. Also remember to show your appreciation by bestowing much love and thanks although it may never seem to be enough, treating your babysitter to a special dinner, or raking up the leaves from the large still-living trees on our shared property line. Try not to use a lack of time as an excuse for not doing the things that are important to you. But don't feel guilty thinking that if it is really important, you'd make time to do it. It's hard to do it all. Wake up before the kids do. Waking up early is hard. Although it can be difficult to get out of bed and get going before 6 a.m., things like: walking the dog, making sure bags are packed and breakfast is on the table, really are a lot easier before little children start making demands for your help and attention. And if necessary, stay in bed until the first one wakes up at 6:30, but take her with you to walk the dog. It really can be calming and help to centre your focus for a while on yourself. Plus it can give you an excuse out of the bedtime routine at least once a week if you choose your class schedule appropriately. Visit the lost-and-found on a regular basis. If you want any chance of recovering the items lost almost daily, it's wise to keep on top of it. Kind of like the laundry. Sometimes, if possible, it might just be a good investment to take a vacation day or two in order to 'get on top of things' again around the house. Wash the windows. Change over the children's seasonal wardrobes. Fix the drywall that the dog has been chewing. Those things that might otherwise never get done. But try also to allow time at least for a pedicure. Or a nap. Remember that lots of other people are in the same boat. It can be hard to remember that many of the people at your work, on your commute, in your day-to-day life, are also working parents. Chances are pretty good that even the CEO, the person selling you your coffee and the teachers at the school have also been struggling with disrupted sleep, lost backpacks, and behavioural issues with their children. Or at least been through it in the past. It's somewhat comforting to know that we are all managing somehow. It was a difficult evening. The commute home was long and slow. I was trying to figure out what on earth we would eat for dinner. I decided that I'd get the girls first, then make a quick trip to the grocery store for salsa and sour cream. I was pretty sure I had everything else I needed for black bean quesadillas. Daycare pick-up started out just fine. But after generously allowing them to play on the playground for a few minutes, I ended up counting down from three, screaming my children's names, and chasing after them one time too many. There is no one else or no other thing in this world that gets me so angry as when my kids don't listen to me. Especially at the end of a long day. It would feel so good to yell. But in the presence of other people, this doesn't seem acceptable. Which just makes me more angry. The seething beneath the surface, deep breath, mental count down from ten, kind of angry. I swear, I never had a temper before I had kids. Dealing with difficult, insolent behaviour in front of other parents shouldn't be hard. They must all deal with the same things too. So why do I worry that they are judging me, thinking that I have no control, that I'm too strict, that I need to be a more consistent with discipline, that I need to relax. I'd love if people would look at me with three little kids in tow and think 'wow, she's really got it together'. Instead, I'm afraid that people are thinking 'wow, that poor haggard woman really needs some help'. I picked up Superman from the after school program for my oldest daughter. Superman is incredible. When the counsellors say Superman, the kids all stop what they're doing, look at the counsellor, put their hand in the air and their finger on their lips. There is silence. I've started using Superman (albeit less successfully) at home. 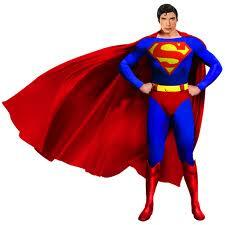 Sometimes I think I need someone to use Superman on me. After a bit of a breather and snuggle at home, and a text noting that Husband wouldn't be home until at least 7, I made a decision about dinner. Old MacDonald to the rescue. As it turns out, today was McHappy Day. The girls were greeted by Ronald when we walked into the restaurant, and Olympic swimmer Zsofi Balasz sat with us to eat her Happy Meal. The kids had fun, and in spite of feeding them chicken nuggets, cheeseburgers and French fries, I felt somewhat redeemed knowing that I was supporting a worthwhile cause. McHappy Day helped to make me happier. I also read this great post about acknowledging the difficulties of parenting young children. It came to me at just the perfect moment. And then, finally, the girls were asleep. It was a happy ending to a challenging evening after all. Yesterday, I dressed up as a princess to go to a birthday party with with almost-5-year old daughter. It was a princess-party, obviously, attended by about a dozen friends from pre-school, and parental escorts, all dressed up. The house was beautifully decorated with lanterns and banners. There were fancy cookies, pinwheel sandwiches, fruit kabobs, and a rice krispy tower. Rapunzel, herself, was even there as a special guest. Meanwhile, beyond a gathering of aunts and uncles and grandparents, I have never even hosted a birthday party for any of my three girls. I had always thought that turning five was a good time to start throwing birthday parties. But my oldest is now six and a half, and my middle is about to turn five. And we're still party-free. We also don't do the playdate circuit. It's just always seemed too complicated to me. As for birthday parties, my excuse is partly because my oldest's birthday is in early September, before school starts. And at five turning six, she didn't yet have a real established group of friends. Or least friends for which I had the contact information for the parents. I guess that is the real problem here. My unease in being socially outgoing. I'm just not good at initiating relationships, making connections and developing friendships. Which I'm mostly okay with, personally. But for my daughters, I know that I need to work harder on this. It's hard to justify not giving them a birthday party just because I'm uncomfortable approaching their friends' parents. I don't want to feel responsible for denying them opportunities to have fun with their friends, or for leading them to be as socially awkward as their mom. So I'm going to work on this. It'll be as good for me as for them, right? Next question: Is two weeks enough advance notice for a birthday party invitation for my five year old? Last year, as part of a employee development activity at work, I read "The Leader with no Title" by Robin Sharma. Since then, I have thought about the book a lot. But I'm not sure whether it has helped me, or made me more confused. The Leader with no Title was the first motivational, leadership, career-building self-help book I've ever read. And I'm glad to have read it. But I don't think that it has motivated me to read many more. It's written in what they call a 'modern day fable' style, which makes it a really easy read. It is also filled with many gems of wisdom and inspirational quotes, which, although individually valuable, quickly become overwhelming and tedious when they are so often repeated, and paraphrased, page after page. The Fourth Leadership Conversation – To be a great leader, first become a great person: SHINE: See clearly, Health is wealth, Inspiration matters, Neglect not your family, Elevate your lifestyle. I was also initially quite annoyed by the main premise of the book: that you don't need to be a manager or 'big-wig' to be valuable to your company. It almost seemed like a conspiracy. Like if some HR directors and CEOs figured out that they may be able to get their average-joe employees to contribute more to the bottom line by boosting their esteem, telling them that they too can be leaders, and convincing them that the big paycheques, corner offices and managerial perks aren't really important in life. Yes, it's true. The managerial perks and big paycheques aren't the most valuable things in life. A meaningful life comes from doing what we love and loving what we do. I get that. The book focuses a lot on what we can do to improve our lives, rather than looking externally for things to make our lives better. Quite similar to the circle of influence described by Steven R. Covey in The Seven Habits of Highly Effective People. Another book I haven't read. But probably should. It just doesn't always seem that simple. And the reading of this one book was definitely not enough to have me utterly convinced that its a simple concept to practice and embrace. And yet still, I try. I did take several ideas away with me which I keep going back to in my own head. Now there's a challenge. If making an excuse is going to define me as a victim, that's something I want to avoid. It's just so easy to offer excuses. There I go again. Partly why I've adopted a new mantra of 'no excuses'. To keep me positive. To keep me from being a victim. Small daily improvements – over time – lead to stunning results. This is an example of one of those 'inspirational quotes' which could easily become cliche, and yet, it is a comforting and motivational idea. One that makes big things seem not just bearable but surmountable. Beliefs are nothing more than thoughts we’ve repeated over and over until we’ve made them into personal truths. Every belief inevitably becomes a self-fulfilling prophecy. When talking about being authenic, and true-to-self, Robin Sharma warns to be careful about how we think of and describe ourselves... Which got me to thinking that describing myself as JustAnAverageWorkingMom might be holding me back. But how can we balance realism and motivation? Leadership is about knowing very little about most things and a staggering amount about a few things. Getting things done is not the same as doing great things. I think this is a great point about multi-tasking. I remember struggling even as a kid, wanting to do so many different things, but being dissatisfied with never being exceptional at any of them. Apparently it is better to focus your efforts and energies. I believe that now. The fear you move through when you go to the edge of your limits actually causes your limits to expand. I really like this thought. It's similar to the piece of advice on my Lululemon lunch bag: Do one thing every day that scares you. I seldom do, and yet I recognise how important it is for personal development. The deeper your relationships, the stronger your leadership. Leave every single person that intersects your path better, happier, and more engaged than you found them. Again, the negative voice in my head is speaking up. I'm just not a people person. And yet I know how important this is. Something I definitely need to work on. I don't know if I'd describe The Leader with no Title as a life-changing read. But it certainly has stuck with me. My husband just asked me what I wanted to do today. My answer is nothing really. I don't want to make any plans. I just want to let the kids watch tv. Play. Make a mess. Last week was a blur, and I never really felt on top of anything. We ordered pizza one night for dinner. I was pretty close to late picking up the kids on two nights. I felt like I was scrambling all week long. So for today, I've got some things that I want to get done. (I'm also mentally working on a list of things to do when I plan for a week's vacation, i.e. time off work to do work at home, sometime in May.) But for now, I just want to try to get ahead so I can feel organised and prepared for the week ahead. Finally get around to explaining a variance in my T4 return for our payroll account for our nanny. A $200 credit is watiting for us, if I can just figure out what accounted for the difference. Pick up our vegetables from the farmers' market winter box program. Combine this with a trip to the park with the kids. Plan my meals for the week. Go to the grocery store. Make dinner for tonight and at least one other night this week. Sign permission slips and registration forms for summer camps and programs. Two or three loads of laundry. And finally, tidy up the mess left by kids playing with relatively little adult participation all day long. I have mixed feelings about crafts. I love it when they keep my kids busy, but I am easily flustered by the mess that ensues. And as a bit of a neat-freak, I am certainly not a fan of the junk that is often produced. As I'm sure many a parent can attest to, there is enough junk accumulating in my house as it is. So when a craft project produces something to control the clutter, instead of contributing to it, I'm all in! to-make-with-materials-I-don't-usually-have-in-my-house craft that is featured that month. Fortunately, my daughters recently got excited about a jewellery castle that they saw in a princess craft book. It looked relatively easy, and it seemed like a good solution to our growing beaded necklace* and kids' jewellery problem. ** Plus, it was a great feeling to actually volunteer to make a craft with them, and then to sit down and help them with it. A welcome change from my normal groan and 'maybe-on-the-weekend' response I usually give when they ask about a craft project. floor. But that point aside, it keeps even my attention-challenged daughter focused on a task that ends up producing something that serves a purpose. Of course, we are amassing a large collection of beaded jewellery, but at least it is something that can be worn, put away easily or given as gifts. **I also want to note that each daughter does have her own music-box style jewellery box, but as these have been subject to a lot of wear and tear, the figurine is either bent out of shape, broken or missing. And the boxes aren't quite big enough to contend with our growing collection. We took some grown-up sized shoe boxes and covered them with card stock or construction paper. This seemed easier and more time efficient than painting them. Empty paper towel and toilet paper rolls were used to make the towers. Turrets were made by taking a semi-circle of card stock and gluing the folded cone into place. The favourite part, of course, was decorating with stickers for the windows, and jewels to make it fancy. The towers, turrets and balconies give lots of places for draping necklaces and bracelets. But the best part: the big shoe box that can be used to hide and store a vast quantity of rings, bracelets, necklaces, hair accessories, favourite rocks... you name it - all out of sight! So while the swathing of necklaces across the turrets can look a little messy, it's a small sacrifice for knowing how much more jewellery is hidden inside! 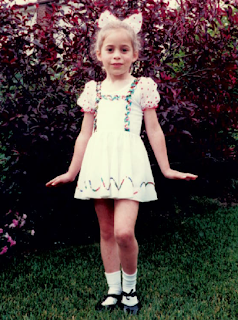 That was me, age 5, in costume for my first tap routine, "At the Codfish Ball", at my first dance recital. Within the next two years, I was taking even more classes, and entering dance competitions and I continued dancing all the way through high school. I also remember swimming lessons, soccer and even theatre classes for a while. Fast forward to today, and the extracurricular activities of my children. My oldest is 6 and half. The middle daughter is almost five. They've been in swimming lessons, and a smattering of ballet classes and sports programs through the city's parks and recreation department. And last fall, in our first attempt to commit to a more structured extracurricular activity, they took a weekly class at a local gymnastics club. It was a weeknight class. From 6 to 7 o'clock for Kindergym. And 7 to 8 o'clock for the older kids' recreational class. The program lasted about ten weeks, and it nearly killed me. Rushing home from work to pick them up from daycare, driving them to the gym, eating a packed dinner to eat before class, during class, or after class, waiting for my husband to arrive at the gym on his way home from work, him driving the younger two home once Kindergym had finished, me sticking aroung until 8 o'clock, taking transit home and ushering the oldest to bed. We decided that weeknight classes are not worth the stress. But weekends are precious. Do we really want to schedule more than one activity per weekend? Potentially multiplied by three. With two full-time jobs plus commuting times, and our desire for priority on family dinners and down-time, will we ever be able to commit to the time and schedules of extracurricular activities for our children? It's not that I want my girls to follow in my footsteps. And let me be clear: I do not want to be a dance mom. But I worry that I'm not giving my daughters the opportunities they deserve to find a passion. Or at least an extracurricular activity to pursue. I know. They're pretty young. And I know this sounds crazy. But I don't want to be responsible for denying them the chance to get good at something. I think of talented musicians, elite level athletes, and skilled artists. It kind of goes with the idea that it takes 10,000 hours to achieve mastery. My daughter is coming up to 7. If she doesn't start at something soon, how will she ever get good at anything? How do you decide what activities for your children to pursue? And how on earth, do you manage to fit it all into your busy schedules and life? I'm sure you've heard about the recent decision by Yahoo! to ban telecommuting. There has, of course, been much discussion among working moms about this latest decision of Yahoo CEO and new mom, Marissa Mayer. I particularly like this post at Working Moms Break, one of my favourite working mom blogs. I also really enjoyed listening to this fascinating radio segment from CBC's The Current, which addressed the question "Is there a future for working from home?" Although part of me can appreciate the rationale behind Yahoo's decision to put an end to their working from home policy, mostly, I can't even believe that it is a question that needs to be debated. I don't work from home on a routine basis, but I believe that for jobs where it is possible and makes sense, having the option and flexibility available to work from home is important to all employees, with children or not. And that it is incredibly important to parents, maybe even to moms in particular. I've written about the wonders of working from home before. But working from home isn't just about having a day every so often to catch up on laundry in between focused, uninterrupted writing and editing sessions, or doing the dusting while on a teleconference. It's more than just a wonderful opportunity to gain some ground in the struggle for work-life balance. "I truly struggled with this decision and feel (the need for) work from home is going to ruin my career possibilities... Until I look at the kids... I also felt weak. I should be able to have it all. But I just can't. I love being home for the kids and having flexibility when they are sick." Being given the option to work from home when needed empowers the employee. It reduces the stress of worrying about caring for a sick child, following daycare and school protocols for keeping kids home with a fever or lice, or scheduling appointments with teachers or physicians during the school day. By having the ability to work from home when we really need to, employers are validating that employees are more than just automatons pushing for a bottom line. That they recognise that there is more to our lives than work. And that makes employees feel more committed to their employers. I mean, how could I work positively or passionately, even, for an employer who didn't value me as a whole person? We have the technology. It doesn't make sense to me to not let us use it. no sweaty 19-year-old dudes, no cover charge, and NO KIDS! new outfit or two for you and your kiddos! Like most parents, I don't get out much. Especially just to hang out with friends. So, although I often shy away from social situations, especially ones in which I don't know everyone there really well, I was excited to accept the invitation and have the chance to hang out with some other moms and women. The evening wasn't anything exceptionally exciting. We stayed in. Drank wine. Ate sweet treats. Played board games. Swapped clothing. And talked. It was a really good evening. I laughed, I enjoyed myself, and I appreciated the opportunity to listen and share. In fact, the evening really reminded me how important it is to get out of the house, away from our husbands and kids and maternal roles. Time to be yourself, by yourself, with your peers. No children to distract us from talking about stuff. Stuff that really mattered to us. And stuff that doesn't really matter at all. It was reassuring to talk things out with other like-minded moms and women. We talked about children sleeping in our beds, trying to fit into pre-parenthood clothes, trash-y television shows, vacations with kids, toiletting experiences in exotic countries, how our tempers have worsened with children, what we remember from our own childhoods, what we hope our children don't remember from theirs, crazy stories about things our kids have done, and how things do seem to get a little easier with time. The experience actually reminded me a little of the pre-natal classes and mom's groups that I was part of way back when... before the little lives and routines of our children got a little too complicated to fit in women-only social activities. Just as before, it was such a comfort to talk things through with other women. To hear that we're not alone in some of the challenges we face every day. You really know how to spoil a mood. We've been having such a good week, filled with lots of things to celebrate. And then, you made your reappearance. It wasn't enough for you to come home with our daughter in January. You liked it so much, your nits decided to make themselves comfortable there once again. Hearing about you today was so. totally. not. welcome. news. Sure, you are tiny. And you don't pose any health risk. But you are such an incredible nuisance. Getting through each day, each week, looking after our girls is challenging enough. The additional worry of your infestation prevention and eradication just throws our routine all out of whack, and adds another stress that we could really do without. Sure, Bill has taken up the daily lice check and nit removal. But it's just one more troublesome chore to fit in. Plus the initial whirlwind of an unscheduled shower, shampoo, lice treatment, wait, rinse, and replacement of all the bedding. Right at bedtime, of course. And don't you realise that I can barely keep up with the laundry as it is! Your arrival puts me about five loads behind schedule. And washing all the hats, scarfs, bedding, towels and everything in hot water - do you know what that is going to do to our hydro bill? Oh, and the vacuuming. Well, at least of the couch and the cushions. But really. Vacuuming? C'mon? Now you're also expecting me to tackle something from seldom-gets-done-list. Just give us a break, won't you please, Lice? Won't you please make this visit your last? I wish I were slim. But I crave chocolate and sweets and eat them irrationally and uncontrollably. I love my kids to pieces. But often I’m not really present with them when I have the chance. I want to do something different, more challenging, and more meaningful in my career. But I am incredibly comfortable with where I am and what I have. I want to be fit and toned. But I fail to make fitness a priority. I actually really enjoy managing our household: making sure there are groceries, planning the meals, sorting through all the stuff, keeping our lives organised. But I go a little crazy trying to balance it all with a full-time job. But I'd go crazy if that is all I had to do. When I’m at work, I think about all the things I could be doing at home. When I’m at home, I’m often thinking about work. I want my kids to participate in activities like swimming and dance and gymnastics and soccer… There are things I’d like to do more of too. But I dislike too much running around and there aren’t enough hours in the day or days in the week, so we all do less than we'd like. I'd like a simpler life, with more time for me and my husband and my children. But we have three young girls, two full-time jobs, two pets, one mortgage. During the week, I look forward to the weekend. But by Sunday afternoon, I’m looking forward to going back to work. I want my girls to grow up being confident and proud and to feel good about their appearance and abilities. But I’m not sure I feel this way myself. I often feel inspired by motivational quotations and ideas. Yet I fail to follow through with the suggestions they make. I think about doing things differently, making changes and challenging myself. But I continue to live with what I have and what I know because it's comfortable. Maybe it's time to start doing things differently. But am I ready? It's just that these posts about my weekly challenges aren't very interesting to write. But I don't want to be accused of not following through, so here it is. I did get a week's reprieve while we were away on our ski trip, (although I did bring and play my ukulele one night!) but back on track this week with both a kale and a crock-pot meal in one night. I'm trying to avoid basic stews in the crock-pot because, although convenient, they usually aren't very good. But I thought maybe soup would be okay, so I tried this Old-Fashioned Beef and Noodle Soup recipe from my Slow Cooker Revolution cookbook. I didn't use blade steak, as suggested. I used plain ol' stewing beef instead. Turns out, I should've used the blade steak. I thought long, slow cooking in the crock-pot with lots of liquid was supposed to mean that tougher, less expensive cuts of meat could be used and end up tasting moist and tender. But no, it still tasted like tough, tasteless stewing meat to me. The kids too, apparently. But they did eat the noodles and most of the vegetables. Maybe next time, I'll dredge the meat in flour and brown it first. The kale was even less exciting. Pressed for time and stuck for ideas, I thought I'd try sautéing it again, but this time with bacon. Like in this yummy Brussels sprouts recipe from Dinner: A Love Story which I reviewed here a while back. But kale isn't as yummy as Brussels sprouts. Of course it was good - it had bacon in it! But it felt a little like cheating. And entirely counter-productive to pair a nutritional superstar like kale with the guilty goodness of bacon. Oh well. As the storm whirls away outside, I realize that there are still many winter weeks of kale and crock-pot meals to go... Who can help me with some recommendations? Just an average working mom. That's me. No different than any other working mom. I love my family and I enjoy my job. I think I'm pretty good at both. I try to do my best at home and the office, but like everyone, I'm working to find balance between my life at work and my life as a mom to three young girls, all while still trying to find and follow my own dreams too. I'm certainly no expert. I'm not even close to having figured it out. But writing about it definitely helps.